Today was a fun day of engineering challenges throughout the school. A huge thank you to our three STEM ambassadors that visited Years 4, 5 & 6: Lee Boycoot (an aircraft engineer), Kim Randell (a software engineer) and Hilary Griffiths (Rutherford & Appleton Laboratory Student). Hearing their love for engineering and progress from it being a childhood hobby, to be ing students and then entering their careers was a real inspiration. Year One were working with K'Nex and other construction toys to build vehicles. Year Two were set the challenging of creating a structure that would support a book without collapsing. They were only allowed to use a set number of cocktail sticks & jelly-sweets! Year Three had to design and make a raft, out of tin foil & straws, that could stay afloat whilst holding pennies. Year Four created small helicoptors and saw a bottle rocket in action. Year Five had to recreate famous landmarks using paper plates, straws and tape. Next week they may be using K'Nex! 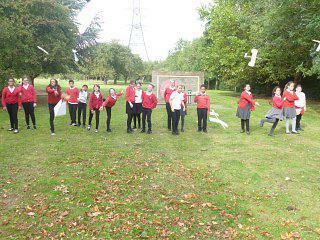 Year Six had to designed and made working gliders unspired by WW2 planes in 6JP whilst 6LK created towers & bridges.